today I am offering a great service. 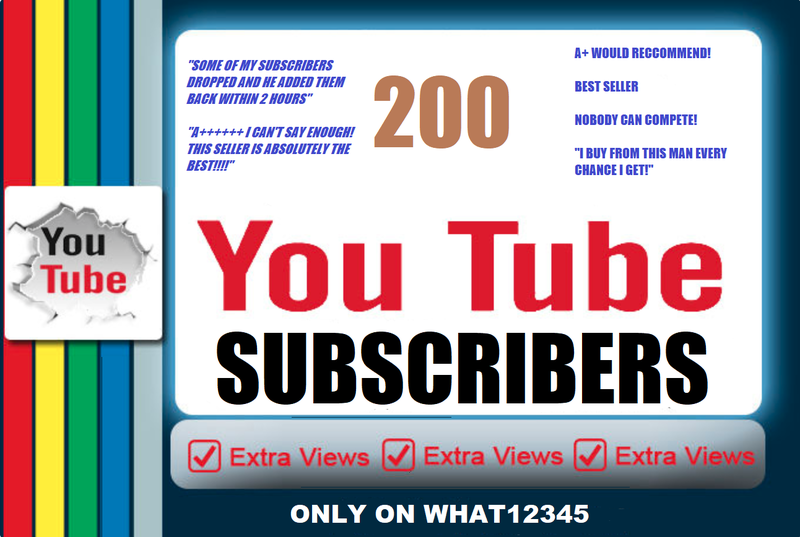 200+ high-quality youtube subscribers for the low low price of only $3! WOW! what a fantastic deal! all youtube subscribers come from unique ips and profiles all over the world. I only need a link to your YouTube channel. ~~FAQ~~ PLEASE READ BEFORE ORDERING OR CONTACTING ME! YOUR QUESTION MIGHT ALREADY BE ANSWERED!! When are you online and able to start my order? I log in almost every hour to check to see if I have any orders. Why is your response time so high? My response time is longer than I'd like because I don't rate my buyers the moment they complete the order. It takes me upwards of a few days because I am a busy person and can't do it right away. If that is the reason you're turned off from buying, don't worry about that. How long will the subscribers take to appear on my channel? orders take anywhere from 24 hours to 3 days. It will take longer for bigger orders. Can you split the subscribers on multiple channels? Yes I can! I can split up to 4 different channels. Can you Drip-feed the subscribers? Yes, this is the only way I deliver subscribers. How many subscribers can you deliver? Don't worry about the amount. If I can't deliver the subscribers for any reason, I will let you know. I want to order X amount of subscribers. How much will that cost? My subscribers dropped! Can you add them back? Yes! Inbox me and I will re add them. I don't re-add bonus subscribers though. Anything over the amount paid for. Lets say you buy 200 subscribers and I give 300 instead. If 50 subscribers drop, It's not an issue because you still have the original 200 ordered. Why did you suspend the service? Will you ever return? I get too many orders at once and I feel the need to suspend the services to finish the orders I currently have on time.When I do suspend my services, they usually come back within 24 hours. TL;DR As long as my services are available, order away. I will suspend them when I feel the need to. My channel only has four videos from five years ago. will you still accept my order? Yes, I will, but you should know channels with hardly any videos on them have a much greater chance for subscriber loss. I want to cancel because "X" or "Y"
If I have already started working on your order (basically when I reply to you after you order from me) I sadly cannot agree to a cancel. 200+ High Quality YouTube Subscribers is ranked 5 out of 5. Based on 95 user reviews.